Bryan Kramer, a Social Business Strategist for PureMatter, recently published an article titled, “There Is No More B2B or B2C: There Is Only Human to Human (H2H)”. Kramer says, “Businesses do not have emotion. People do. People want to be a part of something bigger than themselves. People want to feel something. People want to be included. People want to understand.” So, how do we market human to human, or H2H? It really is the $64,000 question in today’s marketing climate. Here are few things we do know for an engaged Human to Human marketing strategy. 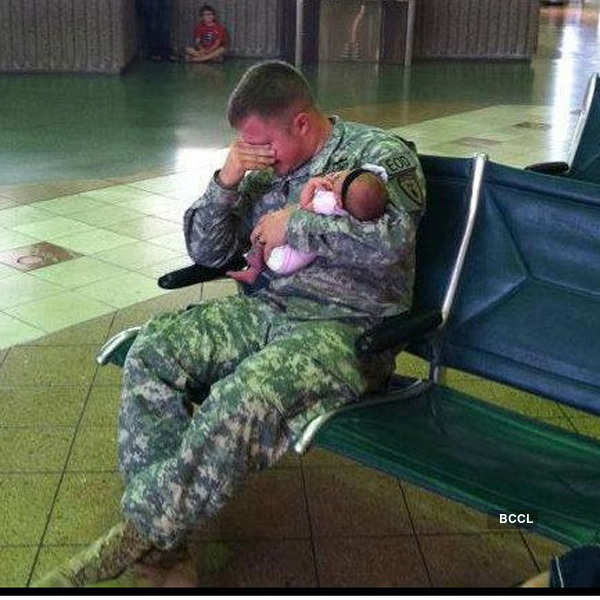 Singer Matt Rogers posted this photo on Facebook with the caption: “This Dad is about to be deployed and is having to say goodbye to his newborn baby girl.” It received 1,612,028 likes and 49,313 comments. Photography and video, especially those that appeal to our emotions, are particularly effective in social media arenas. Statuses are nice. Quotes are nice. But if you want engagement, you need to use compelling photography or video. People are visual creatures by nature. You may remember the ‘Dove Beauty Sketches’. The ad has attracted 4.24 million shares across Facebook, Twitter and the blogosphere since its launch in April 2013, putting it just ahead of GEICO’s ‘Hump Day’ commercial (4.03 million) in the second spot. It’s also the most viewed online video ad of all time. Tell your story. Using video or a photojournalistic approach, tell the story of who you are, not just what your business does. People are more interested in who you are and why you are in the business you are in. What is your backstory? Leverage your story. When people remember you, they remember your business. If people feel that they can relate to you in some way, they will be able to relate to your brand. Why is this important to you? Our extensive experience crafting photography and video can help get great results for you. Got a project in mind? Give us a call, (203) 936-7761. Video is a marketing tool that can be used to reach people across the country, outside of your geographic area. Coupled with the right online marketing plan, a video that showcases your school or organization can extend your geographic reach and boost your enrollment. Miceli Productions worked with Hamden Hall Country Day School in Hamden, CT to produce an Admissions Video expanding their reach nationwide. We spent several days filming activities, sports, academics and student interviews across campus to capture the unique offerings of the school. Voice over and photos provided by the school were add to our footage and complete the story. Most importantly though, this video added visuals that the admissions staff can call on so prospective students can see the campus from an on-the-ground perspective. The video showcases the feeling of campus life to attract students from other states. It conveyed the community spirit of the school to people that couldn’t walk the halls first hand. Our point? It extended the geographic reach of the school’s message. Video is a great tool tool to bring messages to people far and wide. Need to reach people across the country? Extend your geographic reach by using video. We can help. Give us a call, (203) 936-7761.